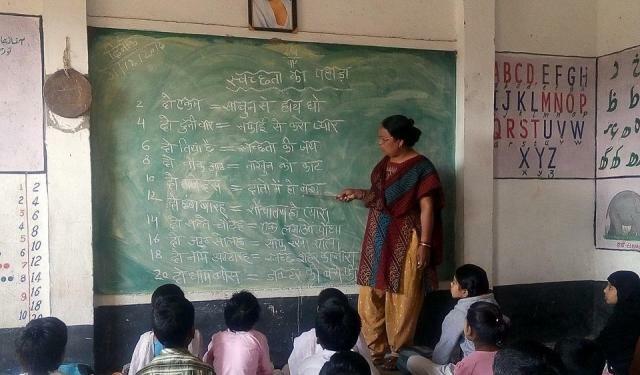 For the 53 students enrolled in the school, it is a routine exercise to go through tables based on the 10 messages of cleanliness before beginning studies as it helps them to inculcate good hygiene habits from a young age.Situated on the Moghat police station road in Maharani Laxmibai neighbourhood of the town, the school started the initiative more than two months back, when school principal Shahjaha Sheik received a rhyme on “Swachh Bharat Abhiyan” on her WhatsApp number.She forwarded the composition to WhatsApp group called “Swachh Vidhyalaya Group” that has more than 20 school principals as members. Sheik decided teach the “cleanliness rhyme to her school’s students in an innovative way so that they could learn and practice good hygiene as well as teach their parents.“It all started after I got a rhyme on cleanliness and as most students were interested to learn it, I decided to ask my staff members for ideas so that we could teach the children learn about cleanliness at an early age,” Sheik tells Hindustan Times. .“Now my daughter has started teaching about cleanliness from the lessons she learns at school,” says Hasiba Bee, mother of 7-year-old Fatima.“It is good that students are being encouraged to keep the environment clean and are being taught not to litter outside the school,” she says.